"When I think about art, it is hard for me to place it merely in the realm of creation. For me, art is much more about the experience and awareness of moments that make life interesting. It is the flash of sunlight through an overcast sky, the sting of a hot pan, the smell of freshly cut grass; it is the appreciation of sensation. 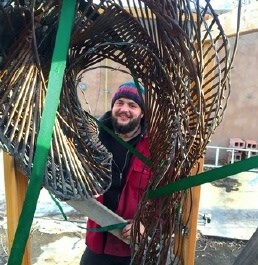 It is the exploration of the world around me; an attempt to discover what creates emotion, and a recreation of those experiences"
Maxwell Bennet has exhibited his work in two solo sculpture shows at Ellsworth Gallery: Life Lines, 2015; Heaven and Earth, 2016, and participated in the 2016 group show Artists' Choice.